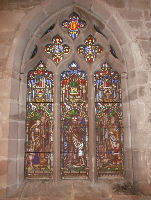 At St. Mary Magdalene we are in the process of raising funds for the refurbishment of the Chancel Windows, in particular the large East Window. Fundraising commenced in 2013 and it is hoped that the work can start in the Spring of 2017. There is substantial cracking about the east window and head and open and dropped joints in the east window tracery. 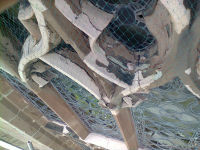 Some stonework has already fallen away and is resting in the protective netting. Damage to the side windows in the chancel, including the signed William Warrington window is apparent in damage to the cills and cracking within the main window. If you would like to know more details about this major project please contact Chris Cherrington at the Benefice Office (Wed/Fri) on 01902 373160 or, to send us an email, please click here.